Happy Thanksgiving, everyone! Today, my family will sit down together to enjoy some heirloom recipes passed down from my grandmother, some of my mother’s exquisite culinary creations, and my contribution to our table, a Maple Vanilla Pumpkin Pie. Most of the ingredients in this pie are available fresh right now in our part of the world, and one day soon I hope to grow these ingredients for a true farm-to-table pumpkin pie. The fresh baked pumpkin and dark maple syrup combine to make this pie a truly unique, hearty, seasonal delight. Try it for yourself! 1/2 cup of the darkest maple syrup you can find. None of that light amber stuff! Slice the pie pumpkin in half lengthwise (such that you cut around the stem). Cut out and discard the stem piece. Use a spoon to scrape out and discard all the seeds and stringy parts from the inside of the pumpkin. Grease a baking sheet with coconut oil. Rub the rest of the coconut oil into the insides of the two pumpkin halves. Place the two pumpkin halves cut side down on the baking sheet. Bake until you smell a delicious caramelized pumpkin scent. This takes about 30 minutes, but it could take longer depending on the size of your pumpkin. When done, the pumpkin skin should be bubbled and the flesh should be very soft and fork tender. Cooking too long is better than not enough, but take care not to burn it. While pumpkin is baking, combine milk and maple syrup in a small pan. Simmer over medium heat while stirring occasionally until reduced to 1 1/2 cups. If using fresh milk, this will take more time than if using evaporated milk, but the end result will be similar. While the pumpkin is baking and the maple milk is simmering, make your crust. See directions below! When your pumpkin has finished cooking, and has cooled enough to handle, scrape out the flesh and pack tightly into a 1.5 cup measure. Set aside any extra pumpkin flesh for pumpkin soup, smoothies, or another pie. Reduce oven temperature to 350, to prepare it for the pie. Add pumpkin, maple milk mixture, flour, salt, vanilla, and cinnamon to a food processor or blender. Puree until very smooth. In a mixing bowl, carefully beat eggs until thoroughly mixed, but try not to whip any air into them. Pour pumpkin mixture into eggs. Mix thoroughly. Pour pumpkin mixture into the prepared pie crust. Bake uncovered at 350°F for 70 minutes, or until firmly set. You should be able to insert a toothpick into the middle of the pie, and see that it comes out clean. Pulse flour, salt, and butter in a food processor until blended. If you don’t have a food processor, you can mash by hand with a fork. Slowly add the ice water while the food processor continues to run until a cohesive dough forms. If mixing by hand, try not to knead this with your hands if possible. It’s important to keep the dough cold, to create a flaky texture in the finished crust. If you do have to knead it with your hands, then cover the dough and stash it in the freezer for 10 minutes before rolling. Liberally flour a pastry board, and roll your dough lightly until coated in flour. Smash the dough down with your hands until it is about 1.5″ thick. Working from the center of your dough towards the edge, roll the dough flat with a rolling pin. Bring the rolling pin back to the center of the dough, and this time roll the dough flat in the opposite direction. Lift the dough, flip it over, and rotate it 1/4 turn. Repeat until dough is round, about 1/4″ thick and sized to line your pie pan. Lay your pie crust over the pie pan, and press it gently into place. 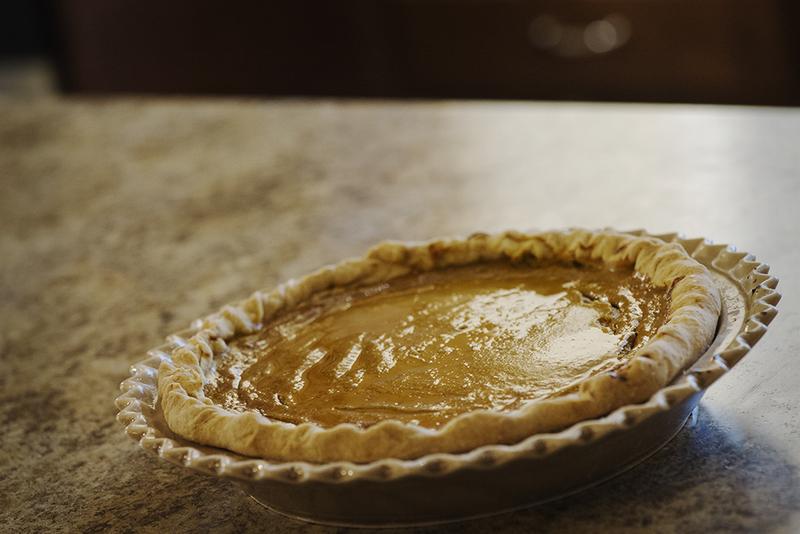 Using a sharp knife, trim away any pieces of dough that drape more than 1″ over the edge of the pie pan. Roll the rest of the excess dough back towards the pie plate and crimp into place for a classic pie crust edge. Cover and store in the refrigerator if you are not going to bake right away.